Indira Gandhi Memorial It is the largest tulip garden in Asia spread over an area of about 30 hectares With 20 lakh tulips of 46 varieties in its lap. It is situated on the foothills of Zabarwan Range with an overview of Dal Lake. The garden was opened in 2007 with the aim to boost floriculture and tourism in Kashmir Valley. Online Holidays is know as the best tour operator in kashmir and specialist for kashmir tulip packages. Day 2 Srinagar City Tour. Day 3 | Srinagar | Gulmarg | Srinagar. Day 4 | Srinagar | Pahalgam | Srinagar. Today you will be transferred by road to Pahalgam (94 kms/2.5 hrs) Valley of Shepherds.Enroute you will have an rare opportunity to visit the Saffron fields. Also visit Avantipura Ruins & Anantnag Sulpher Springs enroute, Enjoy the bounty of Nature at Pahalgam, located on the bank of beautyful Lidder River, Return to Srinagar, Overnight in the Hotel..
Full time Shikara For Houseboat Crossing. The Vehicle is available for point-to-point services only as per itinerary and is not at client's disposal. Clients are requested to follow the timings in the program. In case any service is missed due to delay in departure, we will not be responsible for any refunds. Tulip Festival in Kashmir celebrates the blooming season of the magnificent Tulips. Indira Gandhi Memorial Tulip Garden adds to the natural beauty of Srinagar. Nestled on the foothills of Zabarwan Range, the largest tulip garden in Asia presents a stunning view of the Dal Lake. The seven terraced garden was built with the intention to promote tourism and floriculture in Kashmir. 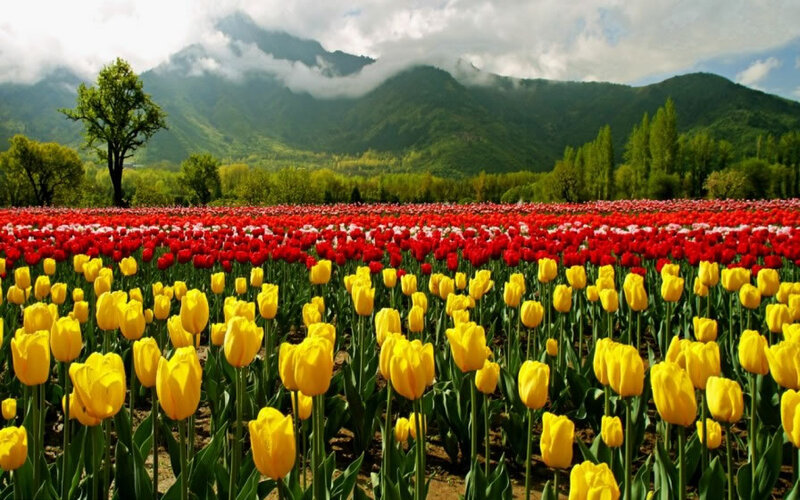 Online Holidays Srinagar rings you best Kashmir Tulip Packages for 2019 to explore the magical beauty of the Tulip Garden in Srinagar in 2019. Tulip Festival is hosted in Kashmir Valley during the onset of Spring Season. You can get ready to be a part of it this year as the festival will commence from March 2019. Major Highlights of the Srinagar Tulip Garden. Tulip Festival 2019 is a must attend event for the flower enthusiasts, nature lovers, fans, aficionados, tulip lovers, and tourists from around the world. There are many varieties of this amazing flowers, some of them are mentioned below. Let’s see how many of them you can find at the Tulip Festival. What’s special in Kahmir Tulip Festival of 2019?